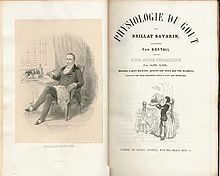 Among other things, April 1st is the birthday of French gastronome, Jean-Anthelme Brillat-Savarin (1755-1826), famous for his book, Physiologie du goût (The Physiology of Taste), published in 1825. The book has never been out of print and was first translated into English by none other than M.F.K. Fisher in 1949. In honor of Brillat-Savarin, April 1st is also Edible Book Day, otherwise known as the International Edible Book Festival. Started in 2000 by librarian Judith A. Hoffberg and artist Béatrice Coron, this global, yet ephemeral festival is realized when small groups of people get together to quite literally “eat their words”. Photos from various celebrations are submitted to their webpage, and I urge you to check out the fantastic and mouth-watering creations – a few of which I have included below. As the Festival can be celebrated either on April 1st or any date near to it, there is still time for you to create your own delicious visual pun. I am still working out the details of mine. Bon Anniversaire Brillat-Savarin! This entry was posted on April 1, 2011, 3:37 pm and is filed under inspiration, Kitchen Alchemy, make. You can follow any responses to this entry through RSS 2.0. You can leave a response, or trackback from your own site.